Mix together the red wine, cassis, and cornstarch in a small bowl. Pour into the pan, and simmer for 3 minutes, stirring constantly, until the sauce is thickened. Add raspberries, and simmer for another minute until heated through. 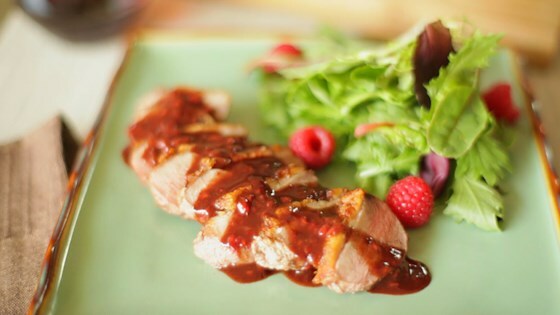 Watch how to make this delicious duck breast recipe! Too many flavors. The duck preparation was good, but the sauce and sugar/cinnamon was too much. I added ginger - it's delicious! Berries on duck are a particular favorite for me. IMHO, raspberries are the perfect compliment - sweet and tangy juxtaposed with the meat's smooth rich flavor. Awesome. nice and easy recipe. ihad to use triple sec instead of creme de cassis due to availability. tasted fine. would make this again.